Welcome to the SingStrong DC High School Competition! This is an opportunity for the best high school groups to compete! The winner also gets to open at the SingStrong Concert on Saturday Night! The Rules can be found below. Though changes in these Rules are rare, all Judges and Participants are expected to have read and agreed to the rules as posted on this site on the day of the event. It's FREE to apply. There is also no separate fee for entering the competition, if all participants purchase a Full Weekend Pass or ClassPass. APPLY. Send an email with your contact info and an MP3 or youTube link of your group to Rita and fill out this form. ACCEPT. We'll evaluate your materials and email or call you back to let you know if your group is accepted. CONFIRM. Your participation will be confirmed by email after you purchase your passes. It's that simple! To encourage technical proficiency and artistic creativity in high school level a cappella singers. Any group consisting almost exclusively of high school students of (almost) any size, style or composition may enter this contest. Performers may compete in more than one group. If a group consists of some Jr. HS students, this will not be considered a problem. If a group has a limited number of recent alumni who are no longer in HS, this is also not a problem. Student or non-student directors may conduct from on, or off-stage, if they desire. However groups who choose to do so should be aware that many judges view conductors (student or non-student) as negatively impacting a group’s performance. Only you can decide if the positive musical effects outweigh the potential “detraction” to your group’s performance. A non-student conductor may speak in between songs if they wish, but they may not sing or otherwise contribute musically, other than by conducting. Exceptions may be made for last minute illness, at the producers' discretion. Groups may be of any size, from a minimum of just 1 person, up to a maximum limited only by the reasonable restrictions of the performance space as determined by the producers. As a guideline, most stages can easily accommodate a choir of 100 or more. If you wish to bring a group of 25 or more, contact the producers and your group will be accommodated. Groups in the Finals shall perform for 8 minutes or less. If there is a Tier 1 prior to finals then groups competing in Tier 1 shall perform 1 piece (not to exceed 4 minutes). Groups may perform the same or different material in Tier 1 and The Finals. Timing shall begin with the first deliberate sung or spoken utterance, choreography or blowing of a pitch and shall run continuously through applause and performance until the last deliberate sung or spoken utterance, choreography or blowing of a pitch. Technical difficulties causing delays will be credited to the performers so that the group receives their originally allotted time. Groups may use their time to perform as many or as few songs as they wish. Groups shall not be penalized for ending on time or under time. Groups may be penalized for going over their allotted time, at the discretion of the judges. Groups are advised to plan time for brief applause after each song. All competing groups will receive the order in which they are performing upon arrival. Performance order will be determined at the sole discretion of the producers who may take into account any number of factors in programming including last minute travel emergencies, technical set up requirements and creating an enjoyable and entertaining program order from an objective audience perspective. Judges are instructed to resolve close calls in favor of the more original or creative group. Judges are instructed that the sound engineer is not being judged, and to be vigilant in listening for and scoring the singers' performance only. Judges shall rate performances in a genre neutral manner, showing no favoritism towards any genre (classical, jazz, barbershop, pop, punk, hip-hop, etc.) over another. All areas of performance, including repertoire, wardrobe and choreography should be appropriate for family audiences. Failure to adhere to this rule may result in penalty or disqualification, at the discretion of the producers. All performances must be completely a cappella and no instruments or percussion of any kind are permitted, with the exception of pitch pipes or similar devices used solely to generate a starting pitch. Solely for the purpose of assigning individual awards, and not for the purpose of assigning group awards, in the discretion of the producers, judges may be instructed to apply a bias against any individual performers who have matriculated from HS, or are materially older than approximately 19 years old. As examples, if a high school student were 21 years old, we would likely not award best soloist to that individual, regardless of their talent level. If a student had graduated in January and was competing as an alumni in April before even beginning college, we likely would still award best soloist, if deserved. If a group had a recent alumni who returned to provide vocal percussion, the group could win First Place, even though the individual could probably not win the award for best vocal percussion. If the piece is an Original Composition. If so by whom? If the piece is an Original Arrangement. If so, by whom? Soloists, per song, in order of appearance. For duets, indicate part or another way for judges to identify individuals by name. Short Group Introduction. Please note that our emcee will need a different and interesting introduction for each group. Please make your introduction short, sweet and specific. Example of a good intro: The Singing Noodlebonks were founded in 1956 and have since won over 50 awards, including the 2009 CARA award for best high school pop album and the 2013 RARB award for Album of the Year. 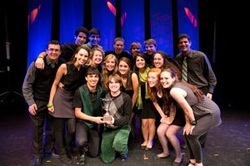 Their director has a range of 6 octaves, and their tenor lead was a finalist at the 2013 American Idol competition. They promise their audiences a backflip, a cartwheel, and a dominant seventh chord in every set: From Fontana High School, please welcome the Noodlebonks! Example of a bad intro: "The Noodlebonks are Fontana High School''s premiere singing group. (Every group claims to be the premiere group.) They sing all different styles. (Boring.) They're really excited to be here. (Irrelevant.) They held auditions this fall and now they have the sixteen best singers in school! (Yawn.) They make all the sounds with their mouths and other body parts! (Beyond obvious; this is an a cappella festival.) Give it up for Fontana High School's number one group, the Noodlebonks! (Empty boast). During the performances, judges shall make written comments for the benefit of the groups. Scoring may be used in some sections. After the completion of the performances, the judges shall confer with one another privately and each shall exercise one vote towards each award. The applicant with the most votes shall be declared the winner at the conclusion of the concert. If there is a tie, then SingStrong producer(s) or one of them shall exercise a tie-breaking power to decide the issue. The judges shall make their written comments available to the competitors and shall endeavor to keep their comments in such form as to be constructive to the participants. Please notify one of the SingStrong producers if you wish to have judges' comments and scoring sent to you. Most groups of 8 or less, perform on individual microphones; most larger groups use area mics or a combination. We will provide microphones and amplification at the competitions. We can usually offer up to 18 wireless mics. Groups of any size may perform on mic or off mic at their discretion, up to the restrictions of our technical set-up. Additional sound equipment, including effects, may be used if approved by the producers. Approval usually requires that your effects be made available to all performers at their sound check. Requests regarding mixing and effects made to the sound engineer will be honored where possible, including the request to enhance bass, vocal percussion, leads or to “use your best judgment”. In the absence of any contrary instructions, the engineer will be instructed to provide microphone responses of approximately equal volume and NOT to do any mixing which would affect the balance of parts during the show. A sound check is not absolutely guaranteed, although we will provide our best efforts to provide all groups with a sound check. If a sound check is provided, all groups shall have approximately the same amount of time to sound check, except for groups arriving late who shall have sound checks at the producer's discretion. Where time is short, soundcheck may take the form of a short instruction or orientation on mic technique given to all performers simultaneously, rather than a true soundcheck. Like performance order, soundcheck order and nature will be determined by the Producers at their sole discretion. Judges and groups must disclose to producers in advance, any potential conflicts of interest, which could be reasonably perceived as projecting even the appearance of impropriety. Judge has arranged or composed material for competitor, even if for a fee. You must notify us immediately if you or any of your group's members have any family or current business relationship with any SingStrong Inc. officer, director, trustee, or independent contractors. A director may request of the producers at any time before the awards are announced on stage, to have their group receive comments only and not to be ranked. Such a request may forfeit a group’s ability to win awards, if any. The producers may in their discretion announce only the top ranking groups. All participants and judges agree to abide by the highest ethical standards and not to publicly criticize the participants (other than in written and verbal performance comments), judges, producers, staff, decisions or rules of this competition, but instead to direct any statements to the producers in private correspondence. At the discretion of the producers, groups may sell merchandise immediately following their show. Please notify the producers if your group wishes to sell merchandise.You agree to be solely responsible for any taxes, fees or economic damage of any kind due as a result of selling merchandise. An arrangement may be noted as “original” if prepared for the group by a member of the group or if prepared solely for the exclusive use of the group. A composition may be noted as original only if written in whole or in part by a member of the group. Any open issues, vague or confusing terms, or disagreements of any kind relating to this competition shall be resolved by the producers in their sole discretion and their determination shall be final and binding on all persons. The producer may use the name and likeness of any group or any of its members or directors or other supporting persons to promote a cappella generally, to promote a cappella or charity events, or to promote any of our programs or materials. The producer may record in analog or digital video, analog or digital photograph, analog or digital audio or by any other means, the group and/or its members and support persons for archival, promotional or distribution purposes, whether by digital, analog or other means, whereby all proceeds shall be paid to producer, producer's affiliate, assignee, subsidiary or partner, or a 501(c)(3) not-for-profit organization. All participants agree to hold the producers harmless and indemnify them from any and all claims which may arise in connection with any of producers' events. These terms are in addition to the terms and conditions posted or linked to at the time of ticket or pass purchase. In the event of a conflict between the terms, those most strongly favoring SingStrong's interests, in its sole judgment, shall control.